Inmates at the Washington State Penitentiary tend a 10-acre garden that raises all the produce consumed at the prison during growing season. 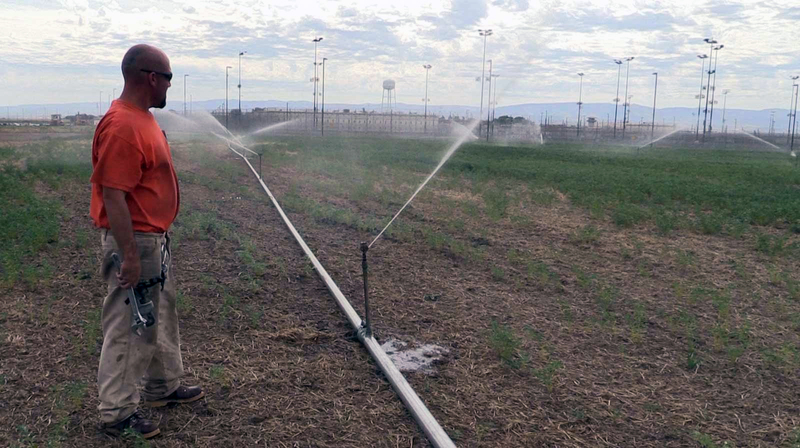 Flint Pulse, an inmate at the Washington State Penitentiary, works on a sprinkler system that waters a 250-acre farm run by Correctional Industries in Walla Walla. WALLA WALLA - Flint Pulse never thought of farming as a career while growing up in the Tri-cities area, but a two-year prison sentence has changed all that. Pulse, who’s serving time at the Washington State Penitentiary (WSP) for a drug conviction, spends about 35 hours a week helping tend a nearby 250-acre farm run by Correctional Industries, part of the Washington Department of Corrections (DOC). “It's wonderful, you know, just to see the crops come out,” Pulse, 33, said while taking a break from working on sprinklers. He looks like a farmer, dressed in work boots and dirt-streaked khakis, but wears an orange T-shirt with “DOC” stenciled in black letters. Pulse said he’ll have the skills to work at any farm when he’s released from prison in 2018. “Coming out here (to the fields) has really increased my knowledge of this type of work,” he said. The farm is part of a much broader effort by DOC to grow its own food and provide inmates with work that lets them engage with nature and learn skills that can prove useful after release from prison. In addition to the Correctional Industries’ farm, which usually grows wheat to provide flour for the state’s prisons, the department also has large gardens at most of its facilities. Last year alone, prison gardens grew nearly 400,000 pounds of fresh produce and they’re still expanding production. The goal is to supply all the fresh vegetables that inmates consume during the growing season, including cabbage, tomatoes, cucumbers, bell peppers, beets, jalapenos, squash and cantaloupe. “My dream would be to have a canning line that would extend the shelf-life of the food that we raise because we do raise an awful lot of food,” said Steve Sinclair, DOC’s assistant secretary over prisons. Andrew Garber visits Walla Walla and shares the story of farming happening inside Washington State Penitentiary. The emphasis on growing food represents a turnaround of sorts for the department. While state prisons commonly grew crops and even operated dairy farms decades ago, those efforts were largely abandoned over time in favor of just buying food from outside vendors. The department recently began moving back to growing its own food, in part because of the Sustainability in Prisons Project, SPP, a joint collaboration between DOC and The Evergreen State College. The project focuses on bringing science and nature into prisons as a way to change behavior and provide skills inmates can use when they leave prison. SPP has fostered efforts not only to grow crops, but also create closed loop systems where food waste is mulched to create nutrients that are then put back into the garden to grow more produce. The project has helped start gardens, chicken coops, bee hives and even vermiculture programs that use millions of worms to convert food scraps into nutrient-rich soil. Those efforts, among others, have helped the department create highly productive gardens tended by inmates both inside and outside prisons. DOC has even partnered with community colleges to provide horticulture classes and certification to inmates at several prisons. The intent is to teach them how to sustainably grow produce and then bring it to market. Not only do the department’s efforts provide fresh produce for inmates during the growing season and provide skills, but the gardens also help make prisons safer, Sinclair said. The state penitentiary in Walla Walla has the most land under cultivation of all the state prisons in Washington. In addition to the Correctional Industries’ wheat farm, the prison also has a 10-acre garden located just outside the perimeter fence. The facility also recently created a “green zone” inside the prison where inmates grow produce in green houses. The 10-acre garden by itself supplies more fresh produce than inmates can consume during the growing season. Surpluses are donated to food banks and other non-profits. Last year, 268,000 pounds of vegetables were harvested, including 71,000 pounds of zucchini, 41,000 pounds of bell peppers and 29,000 pounds of acorn squash. Inmates working in the garden say they enjoy the camaraderie in the fields. Sherman Roland, 55, talked about harvest time when they pick cabbages the size of basketballs. “Everybody's in harmony. We make it fun. We make it enjoyable,” he said. 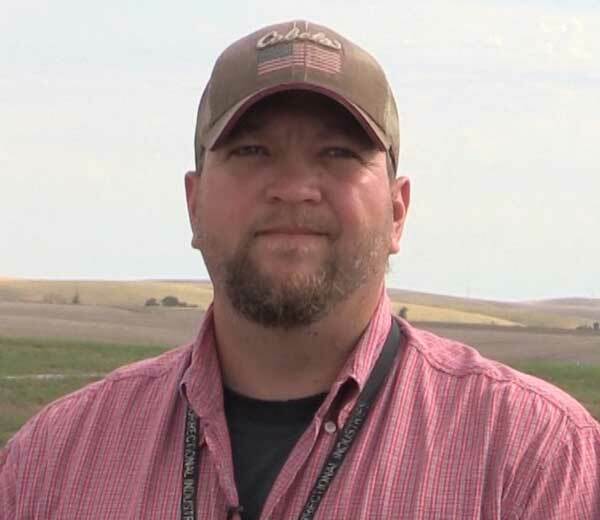 Richard Thompson, who oversees the Correctional Industries work crews on the wheat farm, says he sees inmates change after they start working in the fields. Pulse, for his part, said he’s learned a lot from Thompson and feels ready for the future. “I get to go put my hands on the crop. I could turn around, do the shop thing and I get to drive. I'm getting the best of all worlds,” he said.